On-farm forage assessment was conducted on sandy soils in three provinces (Binh Dinh, Phu Yen and Ninh Thuan) of south central coastal Vietnam (SCC VN) from May 2010 to December 2011. The experiment had two purposes. The first was to evaluate the yield and nutritive value of five forage species, Panicum maximum, TD58; Brachiaria hybrid, Mulato II; Pennisetum purpureum, VA06; Paspalum atratum, Terenos; and Stylosanthes guianensis, CIAT 184, in sandy soils. The second purpose was to assess farmer preference of these species. The greatest yields were obtained from TD58, Paspalum, and VA06. Crude protein concentration was greatest for Stylo, and of the grasses, Mulato II had the greatest concentration. 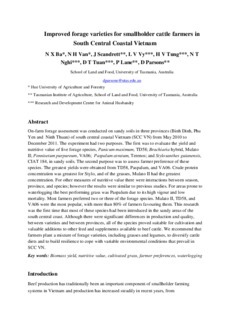 For other measures of nutritive value there were interactions between season, province, and species; however the results were similar to previous studies. For areas prone to waterlogging the best performing grass was Paspalum due to its high vigour and low mortality. Most farmers preferred two or three of the forage species. Mulato II, TD58, and VA06 were the most popular, with more than 80% of farmers favouring them. This research was the first time that most of these species had been introduced in the sandy areas of the south central coast. Although there were significant differences in production and quality, between varieties and between provinces, all of the species proved suitable for cultivation and valuable additions to other feed and supplements available to beef cattle. We recommend that farmers plant a mixture of forage varieties, including grasses and legumes, to diversify cattle diets and to build resilience to cope with variable environmental conditions that prevail in SCC VN.